Super-slim and Portable - Using ultra-thin design concept, and a thickness of only 17mm, the keyboard case is supper light to carry. Multi-angle Design - The spindle approach can change the display to infinite viewing angles, for total range of use, and will bring you a comfortable using experience. 7-color Backlits and 3-level Brightness Control - The seven color backlighting and adjustable brightness, provide user-oriented satisfaction under any environmental condition. Intelligent Switches - The keyboard is a turned On and Off by opening and closing the cover, can automatically wakes or puts the iPad into sleep when it is opened or closed. Bulit-in Rechargeable Battery - Build-in battery will allow you to continuously use this keyboard case at any where you want for up to 5 hours(With backlits) or 181 hours(Without backlits). Ultra Slim and premium looking, makes your iPad into a laptop in seconds. 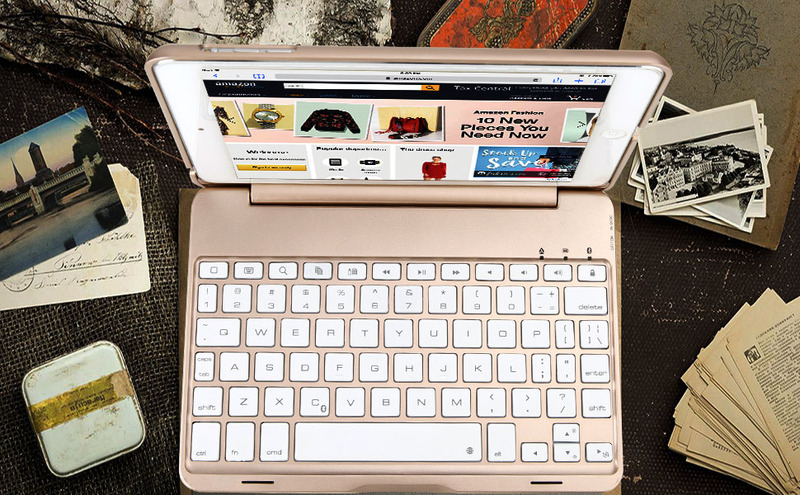 Well Protection and Perfect Access - Premium quality aluminium alloy keyboard case for iPad mini 3/2, protects all sides, edges and surfaces of the iPad. Keeps tablet Safe and Secure. Accurate cutout makes perfect access to all switches, speakers, lightning connector, volume up/down, camera and headphone jack. How to avoid entering the periods when double click space bar? Due to iPad default setting, you may get period when pressing space bar. Please open your iPad and goes to Setting - General - Keyboard - “.” Shortcut (turn it off). How to Remove the iPad Easily? Plase fully charge the keyboard and open it, the light comes on and then goes out. Click on “Bluetooth 3.0 Keyboard” to finish the pairing, the Bluetooth indicator goes out.